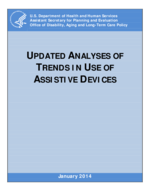 Over the 20 year period 1984-2004, use of assistive devices by older Americans (age 65 and older) residing in the community increased greatly. In 1984, 72% of chronically disabled older Americans made some use of assistive devices, with or without additional human help to perform activities of daily living (i.e., tasks such as bathing, dressing, transferring, indoor and outdoor mobility, toileting, and eating). By 2004, the percentage of chronically disabled older Americans who relied at least partially on assistive technologies had risen to 90%. The percentage relying solely on assistive devices to manage chronic disability doubled from 13%-26% between 1984 and 2004, although most of this increase had occurred by 1999. Between 1999 and 2004, the increase in use of assistive devices was primarily as a supplement to human help. The percentage of chronically disabled elders who relied only on human help fell from 28% in 1984 to 10% in 2004. Because assistive device use is becoming more prevalent among the more severely disabled elderly, including those who continue to require some human assistance, this trend may help explain the increasing rate at which older Americans with severe disabilities are remaining in the community rather than becoming long stay nursing home residents.